← Giving Thanks for Tea: Herbal Concoctions for Digestion! Nourish Your Life-Force: Adzuki Bean + Shitake Soup! We’re officially in Winter mode. It’s cold & rainy, the holiday songs are playing, and we’re ready to spend time cozy-ing up with our loved ones. In Chinese Medicine, Winter is associated with the kidneys, the control center of our life-force energy, and it is said that our vitality and longevity are stored within them. A very important part of nourishing the kidneys is diet and focusing on warming and heating foods will help circulation and movement through the organs and body. Enter Adzuki Bean Soup. Adzukis have been used in Asian dishes for thousands of year and are very versatile because they can be had savory or sweet. Adzuki beans are very high in fiber and protein and help increase energy. Adzuki beans aid in detoxifying and are known for aiding the bladder and kidneys. 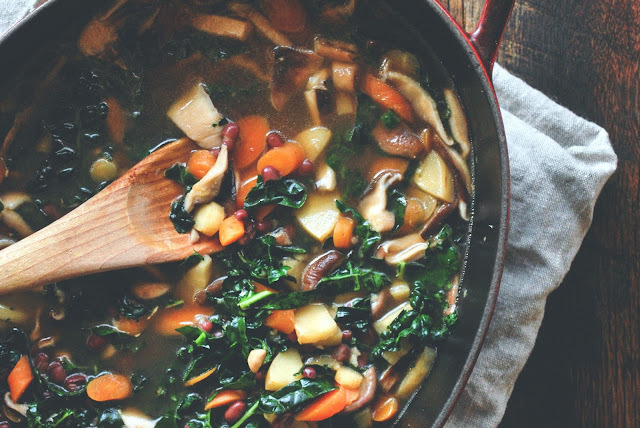 The beans, mushrooms, root vegetables and spices in this soup will certainly warm you while helping to keep energy flowing during a season where things can tend to get stagnant. If you choose to add a grain to this soup, like barley, buckwheat, rice, or quinoa – you’ll achieve complete protein from this dish! However, feel free to add and subtract any of the secondary ingredients to make this a tasty soup for you and one that you will enjoy! Adzuki Bean + Shitake + Root Vegetable Soup! This entry was posted in Acupuncture, Chinese Medicine, Earth and Air Wellness, Health Coaching, Nutrition, Pleasant Hill, Seasons, Wellness. Bookmark the permalink.